There are several answers to this question but the principle reason is physiological. Carp, as most fishes have a swim bladder. The swim bladder is linked to their oesophagus and is used to control their depth in the water. By increasing or decreasing the volume of gas in the swim bladder the fish can either move up or sink down in the water. By leaping or swilling on the surface a carp can force air into its swim bladder through its oesophagus, thus allowing the fish to adjust its level in the water. It is often the case that carp can be seen jumping more often in deeper lakes and less in shallow waters. This would appear logical in as much as the fish has less need to vary its depth in a shallow lake as it does in a deep one. Generally the carp are able to eliminate the gas in their swim bladder by their natural bodily processes, but there are also times when they need to eliminate this build up and a leap facilitates the task. 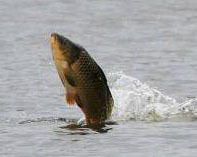 A carp jumping out of the water and landing with a splash can force the air out of its swim bladder. This is often the situation when the fish have spent a fair amount of time in deeper parts of the lake, say depths over 15 feet. As the fish moves to the upper layers of the water so the pressure in its swim bladder increases, in the same way as a diver risks the bends if he comes up to the surface too fast. In order to rapidly expel this excess of gas in its system, what better way than a nice big ‘Ploof’! The shock caused by the fish landing serves to force the gas out of its body. From a fishing point of view this can give us an indication that the carp are feeding in the deeper water. This physiological necessity is though just one of the reasons why carp jump. There are also social and feeding linked reasons. Carp often feed on aquatic creatures such as mussels, crayfish etc. A fish feeding on these creature with rigid shells can find itself with sharp particles of shell in its gills, if the natural sucking and blowing that characterizes a carp’s feeding habits don’t suffice to remove these annoying particles, a good old jump does the job. Similarly in silty lakes a carp feeding in amongst the soft matter on the lake bed may push its head several inches into the silt in order to find the food it is looking for. To clear its gills of any organic matter that has entered them can also be done quickly with a leap or two out of the water. Finally carp are shoal fish and often move together in groups of several individuals. Jumping acts as a way for individual fish to follow the shoal. This I have often seen on large French lakes such as the Orient, the Lac du Der etc, where fish moving in open water regularly “porpoise” out of the water as they make their way across the lake. So one can see that there are numerous reasons why carp leap out of the water. But also the nature of this leaping, (straight up and down , a sideways flop, of a dolphin like jump,) also gives precious clues as to the behaviour of the fish in the water and as such how to best lay our traps to catch them. This entry was posted in Articles, Tips and tagged angling, carp, carp fishing france french angling lakes lake venue venues waters catfish holiday holidays, Carp Fishing Tips, catfish, fishing, france, holiday, winter. Bookmark the permalink. 6 Responses to Why Do Carp Jump? Pingback: Why do carp jump. Glad I found this post as I’ve always wondered if there was a reason for them jumping and now I know.. Thanks..
Is this a pure speculation or are there scientific bases? The article was based on a book in French by a mate of mine who has a BSc degree in the subject of fish. Hi. I was wondering what the name and author was of the book where you got your information for this article, even if it is in French. Thanks!